Join us in celebrating 25 years of continuing progress in fighting hydrocarbon contamination with Evactron® plasma cleaners. XEI president and founder Ronald Vane says “I started XEI in 1991 to fight SEM contamination and I have been stopping dirty pictures ever since. 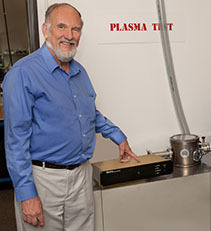 In 1999 I invented the Evactron, the first commercial in-situ plasma cleaner designed for use on an electron microscope. It is the single accessory that you can buy to improve instrument performance, and it enables advanced technologies in FIBs and SEMs equipped with turbo-molecular pumps. Any analytical techniques that need to be carbon-free, such as EELS, low energy EDS, EBSD, BSD, as well as biological techniques including CLEM, 3D imaging, cryo-applications and low voltage FESEM, are made possible by Evactron cleaning. Routine microscope service visits should include plasma cleaning as a final step to a pristine vacuum environment”. Evactron Decontaminators at this year’s M&M 2016 conference were a mainstream FIB/SEM accessory to be purchased with new electron microscopes or after market.